The original Darksiders was a game that pretty much blew past me when it first came out. Until a conveniently-timed Amazon sale a few months back, the only thing I had to say about the game was ‘War looks like Arthas.’ Now, I’ve beaten the first one and it was pretty enjoyable. Some parts were… skull-crushingly horrible (hi 90% of Voidwalker content), but it was a solid game. Nothing great, but pretty fun. 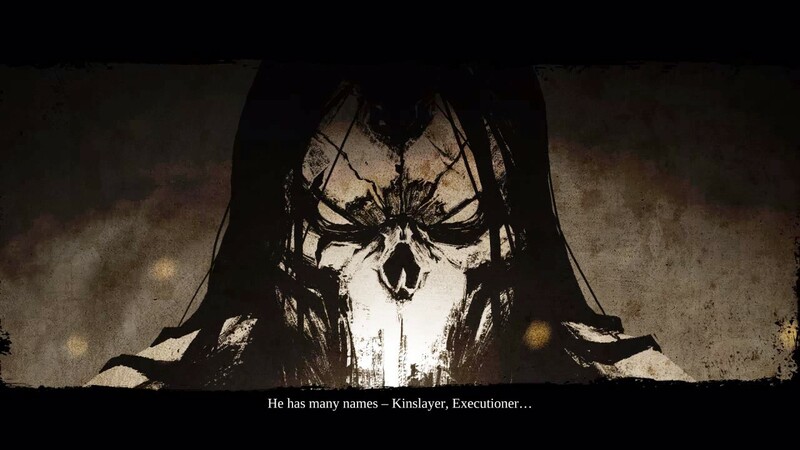 Well, I’ve spent a few hours with Darksiders 2 and let me tell you guys one thing: It’s a hell of a good time. 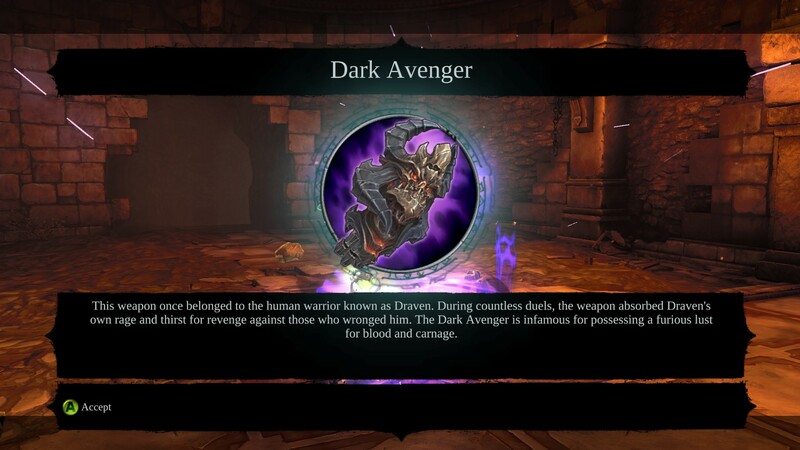 Darksiders 2 takes place at somewhere in the vague area of ‘before the end of the original.’ Instead of playing as the hulking Lich King lookalike War, you get to run around and wreck everything with Death, the oldest of the four siblings. Death is far more agile and adaptive than War, who used a grand total of a handful of weapons throughout the original and felt overall clunky, and handles infinitely better. Everything from the combat to the horse controls – my second-biggest problem with the original – have changed for the better. Combat is more fast-paced and based on split-second reflexes as opposed to ranking up Stoneskin and turning it on in harder fights. Whereas War’s combos and special attacks felt clunky, Death’s feel perfect and you’ll be using them far more often. Exploration is no longer a chore (it helps that Death’s just flat-out faster than War and gets his steed earlier) and is something you’ll find yourself doing quite a bit. About half of my game time has been something along the lines of ‘Let’s see if I can get to that chest/Boatman Coin/vaguely interesting looking hole in the wall.’ If you manage to get to it? The game rewards you, like it should. If not? Go off and do something else then come back later. The biggest change to the game would have to be the RPG elements added. Death has a variety of stats, two skill trees and loads of randomized equipment to pick up. No matter what your playstyle is, you’re going to be able to get something. I’m not entirely sure how much levels add to your character (skill points aside), but getting new equipment such as the super-fast Dark Avenger or the massive Rusanov’s Axe means that if you get bored of one style, you can swap to another. Also, named items have nifty bits of lore about them for flavor text, which is always fun. 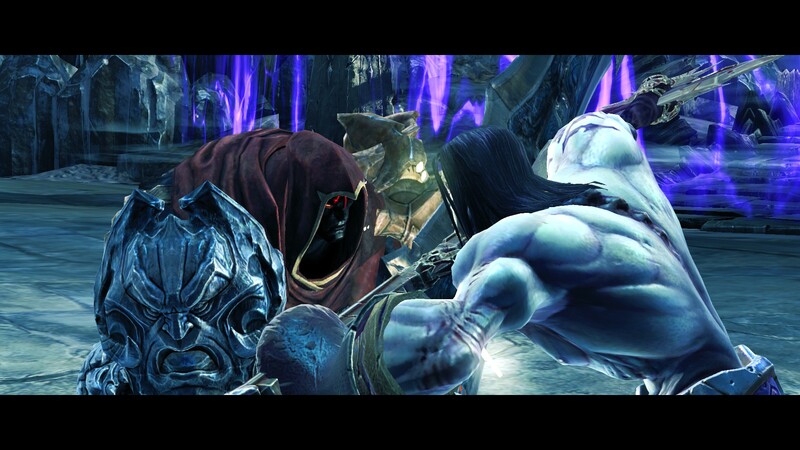 I’d have to say though, my favorite thing about Darksiders 2 is the look and sound of the worlds. I’ve only been to the Maker’s Realm, but there’s a certain haunting beauty that surrounds this ‘world in the autumn of its life.’ You see the crumbling ruins of a once great people and you can’t help but wonder what it was like before the Corruption began to spread. It wouldn’t be half as majestic, however, without the game’s soundtrack. Normally, I don’t notice music in games outside of a few choice songs here and there, but… Wow, man. Darksiders 2 has put out an epic, beautiful score. Everything from a very tribal, percussion heavy fight song to a soft melody with a woman’s voice half-singing-half-chanting in the background. This is such a huge contrast from the original with its Apocalyptic Grey (™) tunnels and fire and brimstone later levels. Even the dead lands of the Fjord and Drenchfort feel more alive and beautiful than Darksiders’ cityscapes. Although, despite my praises, Darksiders 2 is not the perfect game. The interface can be clunky, particularly for PC users who don’t have a controller. The game also has a bit of a tendency to suffer from long-ish loading times (about five seconds was the longest for me) and it will crash if you try and do walljumps too awesome for it to handle. All of these complaints are pretty minor, though. Darksiders 2 is an excellent game and fans of the first one – or just people who enjoy Zelda – should go pick it up. This entry was posted in Review, Video Games and tagged darksiders 2, darksiders 2 review, darksiders death, darksiders series, darksiders war. Bookmark the permalink. Apparently you get some bonuses when you complete the first game so I’m trying to get my hands on the first one and then get this one. You do! It’s two pieces of equipment, not sure if the ‘quality’ depends on difficulty (I beat it on Apocalyptic because I hate myself), but it’s mostly some very nice early game items. Helps make DS2’s Apocalyptic (again, hate myself apparently) much more possible. Good luck on beating DS1 fairly quickly!